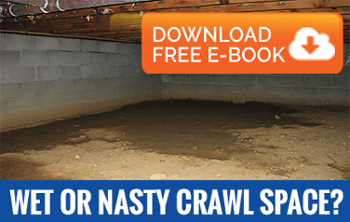 Most crawl spaces are unfinished with dirt floors and little ventilation, creating the perfect breeding ground for mold, crawl space moisture and mildew! With even less use than the attic and basement, mold, mildew and moisture problems really go unnoticed in these areas. Crawl space moisture solutions such as vapor barriers, ventilation systems, and dehumidifiers are just some ways to combat moisture your Charleston crawl space moisture problems. Our Charleston crawl space moisture control specialists have the equipment and knowledge for just what you need! AdvantaClean of the Lowcountry repairs and upgrades crawl spaces of all shapes and sizes. We are certified to install crawl space moisture solutions including vapor barrier systems, crawl space insulation, drainage, sump pumps, dehumidifiers, and much more! Installing an AdvantaSeal vapor barrier or crawl space encapsulation system to isolate the crawl space from the earth. AdvantaSeal is a crawl space encapsulation vapor barrier that will transform your nasty dirty damp crawl space into a dry, usable space. CHARLESTON’S CRAWL SPACE MOISTURE CONTROL SOLUTION EXPERTS! AdvantaClean experts can diagnose your Charleston crawl space moisture issues and crawl space mold issues by properly identifying, recommending and implementing the proper solutions. Our Charleston crawl space moisture solution specialists can perform professional mold remediation in conjunction with addressing the moisture source-- from simple repairs to comprehensive vapor barriers, crawl space ventilation systems and crawl space dehumidifier installations. Our experts have provided solutions and upgraded thousands of crawl spaces across the Tri-County area including Charleston, North Charleston, Summerville, Mt Pleasant, Daniel Island, Goose Creek, Ladson, Moncks Corner, Georgetown, Pawley’s Island, James Island, Johns Island, Isle of Palms, Ravenel, Kiawah Island the surrounding areas for many years. ADVANTACLEAN OF THE LOWCOUNTRY, YOUR CHARLESTON CRAWL SPACE MOISTURE CONTROL SOLUTION EXPERTS!